This entry was posted in Friends, fun stuff, Weekend Writing Prompt and tagged Inustria, Singles Night. Bookmark the permalink. 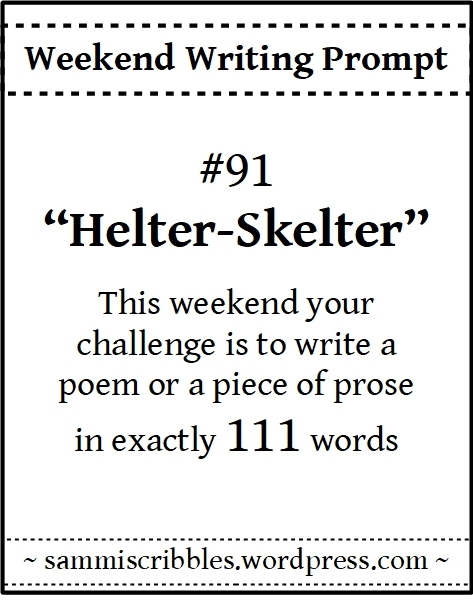 I’m so not surprised that you nailed helter-skelter. I’m with you. Organization? I can hardly spell it, let alone get it together. Loved this and love the pictures. Well done, my friend. Two single gals doing it up! You go ladies! Woot . . WOOT! Nicely done challenge, but you already know you are the mistress of mayhem when it comes to doing these things, dontcha? This particular piece of writing did not leave a . . . wait for it . . . a single word out of place. Sorry (less) but . . I had to! To the challenges, all of ’em. And to toasting them up with friends! To sharing good times with friends! The having a gal pal with you is really important, because that scene can be daunting. Even when it’s organized and is supposed to be chill and fun. It really is. I am not into that scene – at all. We were watching the peeps and just, hey, kudos to them who enjoy it but… not these two chicas. I agree. The scene is just too much. Fun to watch, and as a writer it is fascinating. But the rest of it, nah. Great to watch. Hilarious and yes, now that I actually believe I am a writer, I find myself paying more attention…. very fascinating stuff. Observational skills equal great stories on the other side. Of course, it helps when you are going into it with a clear head while every other person in the joint is already three sheets. Sometimes, these peeps walk in with a few sheets under their belts already! Gotta love the pre-gamers. Sometimes spontaneity is wonderful, as you discovered. It sounds like you had a fun night. I’m so not like that. Deciding only a day in advance to take my mom out counts as being almost spontaneous to me. Hahaha. Love the spontaneity! I hope it was a blast:). I’m all about spur of the moment!! Thank you, Charlie. That we did! Your evening sounds like fun – a bit of spontaneity is good don’t you think ? It was – and I could not agree more! I like your carpe diem style. I used to be organized but have lapsed into one day at a time in my silver years. Two wild and crazy gals. Nice use of the prompt, Dale. Your spontaneity flourishes. Now why am I not surprised? … good morning, dale. And why not? – we only live once! ha ha! Haven’t heard that in a while! I can’t help thinking about the Manson Murders with the term Helter-Skelter, also, the Rolling Stones. I’m not going to look to see how many takes on that there are. I like your take, and I’m going with it! Why am I not surprised? I can go either way. I know! I did everything on my power to avoid those and so did most of the participants! There was lots of murder, though. A LOT more… I now believe in having more decorum… ahem. Ugh…that doesn’t sound like much fun. Sigh. Yeah! That’s the Dale I wanna see. Only if you join me up there! Can’t dance a lick. I inherited my mum’s shapely legs but my dad’s two left feet. Disaster…trust me. I can stand there and take it all in, along with some liquid courage which never seems to muster up the movement.